The BC Utilities Commission preliminary report demonstrates why independent review of mega-projects like Site C is so essential, even with the short timeframe imposed by the BC government (the final report is due November 1). The previous government’s deliberate exemption of Site C from BCUC review is scandalous in subverting a rigorous and transparent public process. Mostly, the preliminary report is a summary of facts and findings, often contrasting evidence from BC Hydro’s own submission, the two Deloitte reports commissioned by BCUC as an independent assessment, and other public submissions (including mine, which is available here). The BCUC has a lot of questions for BC Hydro—73 in all—before it is ready to make a determination on key issues. Most of these are requests that BC Hydro show its math or justify assumptions it is making that are at odds with other evidence submitted. In particular, there are a number of places where BCUC calls out BC Hydro for making bizarre assumptions that lead to biases towards Site C and away from other alternatives. These are the technocratic equivalent of a smack-down. The case for Site C is predicated on BC Hydro’s optimistic forecasts, mostly growing oil and gas demand including new LNG terminals that are not likely to materialize. Even in their low scenario there is still growth in future demand. 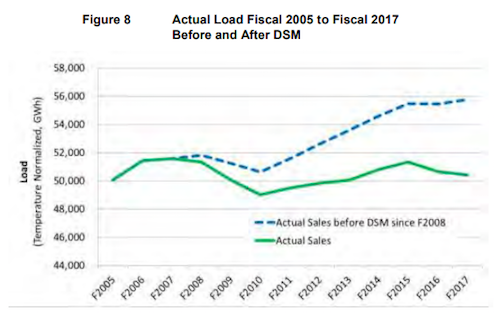 Interestingly, BC Hydro’s submission shows (Figure 8) how actual demand going back to 2005 was flat, while projected demand before conservation measures (DSM or Demand Side Management) would have gone up 12%. The second Deloitte report makes the same comment as a number of us who made submissions: that BCH’s track record for estimating future demand tends to vastly overstate that demand. They also find BC Hydro has assumed much higher GDP growth after year five of the forecast. This has the effect of driving up future demand in their model, and thus the case for Site C. But their projections also do not consider any possible recessions over the two decades ahead, another bias towards Site C.
Deloitte also flags a key (and unrealistic) assumption on BC Hydro’s part that hydro rates will not increase between 2025 and 2036. Given BC Hydro’s overall financial woes, a more realistic assumption that prices will increase would have led to reduced demand, and therefore further undercut the case for Site C. The BCUC report also hones in on an assumption made by BC Hydro that the demand response to higher prices (called elasticity) is much less than estimates made in academic literature. Put another way, higher prices are likely to reduce demand by more than BC Hydro says. Most of the future growth in demand is from the industrial sector—residential and commercial consumer demand has been flat and will continue to be so, with growing population offset by increased conservation or energy efficiency. While the mania for LNG in BC has long since faded, BC Hydro still anticipates surging demand from LNG in the future. Table 11 in BC Hydro’s submission shows that oil and gas accounts for 68% of long term (11–20 years) incremental demand and 75% of long-term incremental capacity. And here’s a paradoxical aside: throughout BC Hydro’s submission, the use of natural gas (or coal) for generating electricity is (rightly) frowned upon. But somehow they see no problem in providing low-cost (subsidized) electricity to the natural gas industry. Deloitte takes a similar approach to my submission in re-estimating future load growth given current information (the decline of LNG in particular), and they conclude that demand in 2036 is likely to be around 6,000 GWh less than Hydro’s mid-load projection. This is larger than the output (5100 GWh) of Site C.
My earlier conclusion holds that BC Hydro will have a surplus of electricity until the early 2030s, and this surplus position could be pushed further into the future if stronger conservation policies are brought in. At some point we might need more supply, but it is not obvious that big lumpy Site C is the optimal way to provide that power. If Site C’s power is surplus, the BCUC is not convinced it can be sold that easily to the US or Alberta. The panel is tasked with comparing going ahead with Site C to an alternative portfolio that would deliver the same output (using only renewable electricity sources). They note elsewhere that such an alternative portfolio may not be needed if demand is not there, but for the purposes of the review they aim to make an apples-to-apples comparison. To this end, the panel completely rejects BC Hydro’s comparison. BCUC calls BC Hydro out for some manipulative comparisons between the costs of proceeding with Site C and an alternative portfolio. They do so in some very technical and bureaucratic language, but BC Hydro looks pretty bad by distorting the comparisons to favour Site C.
If new power is eventually needed in BC, a number of renewable options could be brought in that more gradually meet any shortfall between supply and demand. In their submission BC Hydro’s estimated value of Site C power sold in export markets upon completion is increased to $48/MWh, up from $37/MWh previously. This allows them to claim a profit on any surplus power from Site C that would be exported at that $48/MWh, which is greater than BC Hydro’s new estimate that the cost of Site C power is $34/MWh. Wait, previous cost estimates for Site C power ranged from $88 to $110 per MWh, so how do they get to this low number? It’s a strange calculation, as BC Hydro deducts sunk costs (-$15/MWh), allows for a July 2016 regulatory change capping the dividend paid to the BC government (-$26/MWh), and gives itself a credit for avoiding termination and site remediation costs (-$9/MWh). As the BCUC notes, however, these are not substantiated by BC Hydro, and similar treatment is not made for its alternative portfolio comparator. That comparator alternative portfolio is instead inflated to $153/MWh, based on other arbitrary assumptions that are added by BC Hydro but that are not clearly spelled out, either. On the basis of this spurious comparison BC Hydro makes the dubious claim that the cost of alternative power is 4.5 times higher than Site C. Rightly, the BCUC asks them to explain themselves so that we can have a true apples-to-apples comparison. If new power is eventually needed in BC, my earlier conclusion also stands that a number of renewable options could be brought in that more gradually meet any shortfall between supply and demand. Some of these may be grid-based supply options, but others may be measures that reduce the demand for BC Hydro like solar panels on rooftops or district energy systems in urban areas. A determination of whether the project is on time an on budget is a key piece for BCUC, and an area I did not comment on in my submission. The notion that the project is on time and on budget was questioned in the first Deloitte report, which cites the need to divert the river in September 2019 as central to whether the project meets its objectives. The BCUC report mostly rehashes this discussion, and what the implications would be. Basically, the BCUC finds that the project appears to be on time, as of July 2017, but raises some flags about whether the project will be on budget, especially in light of some technical problems that have emerged during the early construction period, which would mean the river diversion timeline is not met. The Panel acknowledges that other major hydro projects have not been on time or on budget but rejects the relevance to Site C. This is unfortunate. They neglect to mention several recent BC Hydro transmission projects that have also gone well over budget. Also troublesome is that BC Hydro has already spent $356 million of its planned $794 million contingency fund. The BCUC finds that the project appears to be on time, but raises some flags about whether the project will be on budget. I have had a few interactions with proponents of Site C who argue that the project makes economic sense because we have to treat $2 billion already spent as a sunk cost. So it’s Site C electricity at a bargain price. And yet, if cost overruns materialize that case disappears. Even in more optimistic outlooks Site C takes 60 to 70 years before it would break even. The key points raised in my and other submissions about overly rosy future demand forecasts are validated in this report. However, the report neglects to assess the potential impact of more aggressive DSM, and that over the coming decades we will need to withdraw supply from fossil fuel industries rather than increase it (if we are meet our GHG reduction targets). My sense is that the final report will provide some greater clarity and will outline scenarios and options, but will ultimately not give a clear yes or no. That is, it will punt the final decision back to the new BC government. The narrow economic analysis from the review will also need to be supplemented by a consideration of broader environmental impacts and First Nations concerns as part of the final decision. In the meantime we now know a lot more about what we know and do not know. The next phase of consultations leading up to the November 1 final report promises to be very interesting.